People gather for the soccer match between Hodan and Waberi districts, Mogadishu's first night game in 30 years, at Konis Stadium in Modadishu, Somalia, Sept. 8, 2017. For the first time in more than 30 years, thousands of residents and fans watched a nighttime soccer match in Mogadishu, often described as the world's most dangerous capital. Thousands of fans enjoyed the event at Konis Stadium, which the international soccer organization FIFA recently renovated. Although the match, the final of a citywide club tournament for 16- to 18-year-olds, took place under tight security, it was historic for the city, which has dealt with terrorist suicide bombings and anarchy. After the match, in which Waberi beat Hodan 3-0, Mogadishu Mayor Tabit Abdi Mohamed said the city's residents deserve security — and more than a nighttime soccer game. "Tonight is clearly a historic night that our people, the people of this city, waited for for more than 30 years. I reaffirm that Mogadishu is secure and people deserve more than this," Mohamed said. "You deserve every kind of entertainment and sports that people in other world capital cities get." Hassan Wish, the chairman of Mogadishu's sports activities who organized the tournament, said they decided to hold the nighttime game to send a message that Mogadishu is on the road to betterment. Football players from Hodan district (orange) and Waberi district (yellow) play in the first nighttime game in 30 years in Modadishu, Somalia, Sept. 8, 2017. "To publicize and make it a significant signal to the city's returning security, the match was held at a nighttime. It was broadcast live on several local television channels," Wish said. "The city is back on its way to good old days." 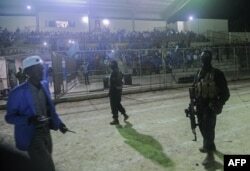 The Somali Football Federation said the Friday night game in Mogadishu took the country back to 1988, when night games were played at the city's main Mogadishu stadium. The stadium has been and remains a military base for African Union peacekeepers, which drove al-Shabab militants out of the city in 2011. "We hope this will be the first of similar peaceful matches in our city. It is not the first for Mogadishu, but for me, I have never seen in my life a soccer game being played at night in Mogadishu," said Dahir Osman, a 20-year-old resident. "I was born in a lawless capital and grew up all these years without witnessing such a hope-reviving event." The seaside capital is working to lose the label of "the world's most dangerous city." The name was attached to the city after the collapse of the former central government in 1992, when a famine struck Somalia and political jockeying began. That led to a civil war and deadly armed violence spearheaded by clan warlords who entered the city. Last month, popular Somali referee Osman Jama Dirah was shot to death near his home in the city. "The city is enjoying a reviving peace, except for the infrequent al-Shabab terrorist attacks. Now, playing a soccer game at night means the city is rearing its beautiful head again," said Aden Osman, a 58-year-old resident who has never left Mogadishu. Somali security forces patrol during the soccer match between the Hodan and Waberi districts at Konis Stadium, renovated by FIFA, in Modadishu, Somalia, Sept. 8, 2017. It was the city's first night game in 30 years. "I was born in this city and still live here. I have witnessed the best and the worst times of the city. But now, I see a reviving hope on the horizon," Osman said. Thousands of Somalis from the diaspora have been returning to Mogadishu over the past three years, opening new, Western-style restaurants along the beach. The buildings that have been destroyed by the bullets and mortars are now being rebuilt. Many U.N. workers, who had been operating from Nairobi, the capital of neighboring Kenya, are moving back to the city, and some foreign embassies have reopened. Since the collapse of Somalia's central military government in 1991, Somalia sports have lacked an infrastructure, and athletes have been threatened by radical militants. In 2006, the Islamic Courts Union, which controlled large swaths of the country's south and central regions, which include Mogadishu, prohibited women from playing sports, especially basketball, labeling it as a "satanic act" against the principles of Islam. The group also put restrictions on men and banned watching international soccer matches from televisions and designated cinemas, saying the men should spend their time on their religious responsibilities.